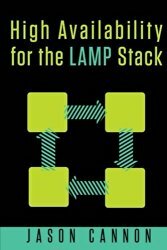 How to Setup a Highly Available LAMP Stack Even If You've Never Done It before, Don't Know Where to Start, or Don't Want to Spend Weeks Researching How to Do It. This step-by-step guide teaches you everything you need to know in order to eliminate single points of failure for your Linux, Apache, MySQL, and PHP based web applications. Do you wish you could ensure your web site was up all the time and finally enjoy a peaceful night's sleep? Do you want to be able to scale without downtime and handle unexpected surges of traffic? Do you want a solution that just works without spending weeks testing various combinations of technologies and software? Do you want someone to lay it all out for you and walk you through an entire deployment? If so, you're in the right place... I understand, because I've been there. I know what it's like to be woken up in the middle of the night when a web server goes down. I don't know about you, but I'm fairly grumpy at 2:47 A.M. when something is broke and I'm the one that has to fix it. That's why I strive to eliminate single points of failure and ensure service availability. I would much rather plan for failure ahead of time than have to react to it. If you have a robust design that's easy to support you can repair any failures at your convenience instead of trying to cobble together a makeshift solution in the middle of the night. I've spent countless hours designing, testing, and implementing high availability solutions for a wide range of Linux based services during my career. I've put together a well designed, well tested solution for the LAMP (Linux, Apache, MySQL, PHP) stack that easily scales to support an increasing number of users all the while decreasing downtime. I've taken each possible single point of failure into account from the obvious ones to the less than obvious edge cases you'll need to cover in order to have a truly robust design. This architecture and design: Works on physical servers. If you're running on bare metal, this design will work for you. Works in virtual environments such as VMWare, VirtualBox, Ovirt, Red Hat Enterprise Virtualization (RHEV), KVM, and Xen. Works in the cloud -- You'll learn about the important nuances for running in the cloud. This design works whether you're using Amazon Web Services (AWS), Rackspace Cloud, or another provider. Scales without downtime…. add more servers or resources without users even noticing. Works with custom written web sites and applications that run on the LAMP stack. Supports popular open source web applications such as WordPress, Drupal, Joomla, MediaWiki, phpBB, Redmine, SugarCRM, and more. This demonstrates everything step-by-step... This is not just a design, though. It's an entire book complete with lessons and demonstrations you can use on actual Linux servers. In the book I'll be performing the demonstrations on Ubuntu servers, but the concepts are the same no matter if you're using RedHat Enterprise Linux, CentOS, or another distribution. The only real difference is the couple of commands you'll use to perform some of the software installations. The design and configurations remain the same. Apply what you learn to other situations Even though this course is targeted directly at the LAMP stack (Linux, Apache, MySQL, PHP), the concepts and techniques presented can be reused in a variety of other situations. If you ever need a floating IP, the ability to add more storage to servers without downtime, to balance loads across multiple servers, or deploy a highly available database cluster, you can put what you learn in this course to good use. The only thing between you and web site that stays up all the time is this book. Get started now by scrolling up to the top of the page and clicking on the "Buy now" button.